Starting out with forward-looking technology. 1999 saw the start of the Swiss Logistics Platform website, which was followed with great media interest. It was still the time when the start of a prominent website attracted television, radio and many journalists, who gave detailed reports of the event. As always, the logistics specialists did justice to their traditional pioneering role in the use of forward-looking technology. Technology without which life today would be unimaginable was in 1999 a radical innovation exploited by far-sighted, daring logistics specialists. Today - an Internet century later - everything is a matter of course. The Internet is more important than ever, and has fundamentally changed our everyday lives. New technology, easy to find. The success story is still going on. In Spring 2007, the new Swiss Logistics Platform was taken to the next level with an updated design and cutting edge technology. Dynamic and exceptionally effective navigation takes anyone interested directly to the relevant information. Unlike many other platforms, only rubrics with content are offered. Moreover, the information specific to each rubric is reciprocally linked, which means that providers and persons interested benefit equally. Everything in German and English. 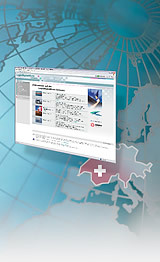 The Swiss Logistics Platform can be viewed in both German and English. This guarantees that all interested parties who understand only limited or no German will find the information supplied in a relevant alternative language. Moreover, the most important search engines respond to the English content and store the information provided by the Swiss Logistics Platform for international customers. The display window for the Swiss logistics sector. More than ever before participating in a strong communal Internet platform brings a competitive advantage. The Swiss Logistics Platform is the innovative display window of logistics experts active in Switzerland. Companies and organizations in the Swiss logistics sector present themselves jointly on the Swiss Logistics Platform. Interested parties quickly gain a comprehensive overview of the entire range of services on offer. Digital presence on the Swiss Logistics Platform is therefore not only an expression of the participants' orientation on the future; it is also an efficiency statement for the whole sector.